First, there is Adium, an Instant Messenger which is able to handle ICQ, Jabber and doesn’t bug you with .Mac (like iChat does). Nice one, but till now I don’t have found how to keep the program at the dock after starting – it always shows you the contact window. Added the VLC video player as well, my mother should have the chance to watch movies too. After configuring the program this way and that way it crashed after every start. It took a while, till I found the command line to restore all settings (‚/Applications/VLC.app/Contents/MacOS/VLC –reset-config‘). Next, after a nice (not only geek) evening with Jule (kisses to her and thanks for the tip with the right mouse button – oh yeah, there is one) I had to install KisMAC, great suggestion. And than activated a SIP telephone account and installed XMeeting, which is a nice little SIP-client software. And for ftp, sftp and so on, I installed the program which has this nice duck as a logo (see right). Cyberduck seems to do what I need, and it’s not only the logo which is nicer than the one from Fugu. Fugu didn’t worked for ftp-servers at my test install and was not able to retrieve whole directories via sftp. Still have to test the included MacOSX Software, but it’s hard to decide if it’s worth to keep it or not. Descriptions are not always clear, like the one beneath. 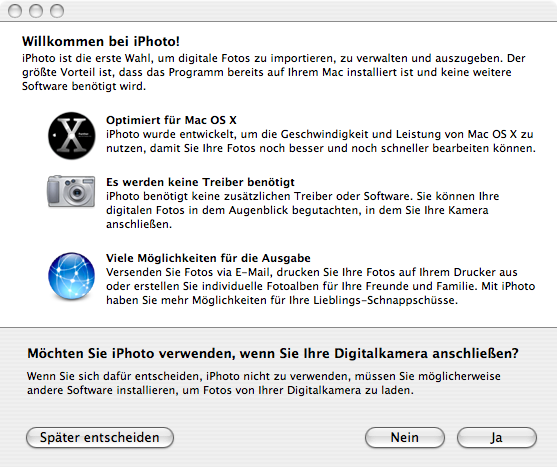 It tells you that you should decide if you like to use iPhoto now. The Dialog appears directly after I attached a camera to the mac. And there is no description what the program does, they say in this dialog the biggest reason to decide to use this program is that its delivered with my mac – wow. So, still no idea if it’s worth to use iTunes, iMovie, iDVD, iPhoto and iWhatever, but I’ll ask some mac users around. (and for my personal usage just added Thunderbird, Firefox and Camino). Quicksilver is a necessity as well for me (the built in launcher in Google Desktop for Mac may be a substitute if you search more often). I guess you got Growl! wih audium, that’s another thing to get if not. adium is a brilliant program, cyberduck looks good as an ftp program, but i dont use that all so much! VLC video player is great. It is a really simple program which does exactly what it says on the tin.